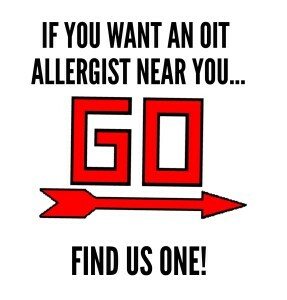 Does your local board-certified allergist need an OIT protocol? Wants to get started? Many of the OIT allergists have been “found” by patients. If they were interested in learning about OIT, the doctors have worked together to train and mentor each other. Since OIT is not YET taught in med school, or during training, it has been old-fashioned “doctoring” which has transformed the field of food allergy. We owe the many clinical trials around the world a debt of gratitude for creating, testing and refining the protocols. Patients have sought out top allergists and pleaded their case for a treatment for their child. Many allergists were interested already and needed initial patients. Private Practice OIT, meaning “not in a clinical trial” has grown through 10 years of grassroot efforts and combined efforts of parents and physicians. Read more about the story of OIT and it’s growth here in About Us. So find the top allergists in your area, and begin a letter-writing campaign today directing them HERE to see their colleagues changing lives every day. Print off a list of OIT studies here: Summary of OIT studies, Dr Mayer’s site. Our innovative food allergy immunotherapy program has helped hundreds of children overcome a fear of food. DallasFood Allergy Center (DFAC) is the food allergy specialty practice at DallasAllergyImmunology. We are one of the few practices in the country that offer a breakthrough oral immunotherapy program for kids with food allergies. Our treatment provides a long-term solution for wheat, egg, peanut, tree nut, and milk allergic patients. It is usually takes less than 6 months, and at the end of the program, most patients with allergies to wheat, egg, peanut, tree nut, or milk are able to consume these foods with no allergic reaction. Note to Allergists/Immunologists: If you would like to obtain a copy of the oral immunotherapy procedures we use, please send an email request to drrichwasserman@gmail.com. Include a link to your website or enough identifiers so that I can confirm that you are Certified by the American Board of Allergy and Immunology. After confirmation we will provide you with the information requested.